These kinds of things became trade items primarily when the whalers — the Yankee whalers — began coming to our coasts. So this is not an exact replica of a umiaq. This one is styled more as a trade item. Many whaling crews still use the skin-covered umiaq because it is lightweight and quieter in the water than a wooden or metal hull. Contemporary crews include both a harpooner and a gunner who fires a bomb gun to kill the wounded whale. Full-sized boats are up to 35 feet (4.5 – 10.7m) long and covered with bearded seal or split walrus hide. Small replicas were made as toys and later for sale to visitors. Branson Tungiyan: Our lacings are sinew. We [Saint Lawrence Island Yupik] have these ribs that go all the way down and we don’t have [horizontal ribs across the bottom of the frame]. And we have another board here between the two seats where we put our sail masts. Aron Crowell: There’s no evidence of a sail on this? 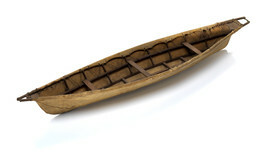 Branson Tungiyan: No, before outboard motors ever came, oars and sails were commonly used. We still use the skin boats for whaling; and we use sails. We sail without the use of [a] motor during whaling . . . and then we finally use a motor after they strike a whale. Branson Tungiyan: We get a lot of driftwood on St. Lawrence Island, and we look for tree trunks that we will use for what we call mayughneq [large piece of driftwood used for a boat keel], the curved part right here and on the keel, on the rear. We use two parts to make the curve on the bow and on the stern and keel and then they start the ribs. And the bottom part is called kuyak [boat keel]. And then laalmiks [ribs of a wooden boat frame]. They’d have to steam these from hardwood so they can bend them. And ingun [seat against a wall or boat seat], ingutet [boats seats], the seats. And the boat captain also has a seat in the back for the boat captain. Sivuyak[front part of a boat], kinguyak [back part of a boat]. And right here in between two seats is another board for St. Lawrence Island style and has a hole and also [on the] keel so the bottom part of the mast can settle in. Branson Tungiyan: We sewed two walrus hide skins together. All the way across two walrus hides are sewn together pretty much in the middle on this type of boat. Once we get those [female walrus] in the spring, we cut off a piece of hide from the old skin that is going to be changed; large enough so that it fits [the folded fresh walrus hide]. They cut all the blubber off from the skin and then they fold it up and put it in this [container made from old walrus skin] and close it up and we age the walrus hide. And then around the middle or last part of June, we would check the fur part of the skin to see if it had aged. When you feel that the skin with fur can peel off is when we know that the walrus hide is aged enough and ready for stretching. Before it can be stretched we put it on the stretcher and then women split that¾the three-eighths inch walrus hide in half so it can become larger And then we stretch them and dry them and then we take them off when we know they’re dry, we roll them up, put them away for awhile until a week before. We use two, two and a half or three walrus hides on larger boats. Suzi Jones: Folded open and so it’s twice as big? Branson Tungiyan: Before the walrus hide is split, the boat captain then cuts all around the edges of the skin at least two inches. It’s called esneli [splitting the edges of a female walrus skin to make cover for boat frame]. And the week before we put on a new skin, we put them into a freshwater lake and we let it sit with weights on top of the hide and soften them up. And then when it’s time to put the skin on the boat, we’d take them out of the water. Now the boat is upside down like this and then we put the skin and unroll them and we’d cut them across as straight as possible, both hides. And the women would make thread out of whale sinew so they can sew them; a lot of work. We also have a wooden keel on the outside of the skin boat that we use and on top of this wooden keel on the outside is [ivory], but now we use plastic, a good three-quarter-inch, one-inch plastic for on the top, which is much easier than walrus ivory. That is St. Lawrence Island style. And then after the women finished sewing, then we would put these lacings [on]. And then we have these special whale bone ribs that we use that they put to tighten on both¾there would be a person on both sides doing that and we’d hit the side so we can stretch it. Now we don’t stretch them so much. We used to do that four, five times to get the skin on tight to the boat. But now since we don’t use the skin boat all year-round, we don’t tighten them as much as we used to before . . . [only] two or three times, we’d tighten the lacings, not four or five times like we used to before. Estelle Oozevaseuk: I used to sew that for my brother’s boat. He taught me better than my mother. Branson Tungiyan: When they sew the two skins together, the inside is sewn first and they overlap and then they sew it. And [the seams] have to be [overlapping with the leading edge overlapping the trailing edge], because they drag the boat forward. We go through young ice sometimes, and that will wear the stitches between the two skins quick.